It was Frank Thomas who said that if you have two characters in one scene who think alike, you have a problem. Of course he is right, it is the contrast in what the characters are thinking that brings a scene to life. 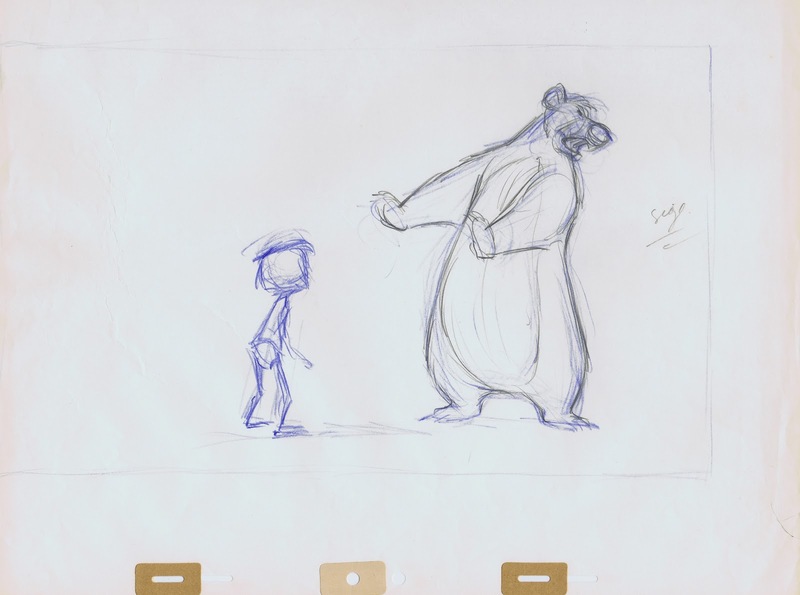 Here are a few examples done by different animators that help illustrate the point. Fred Moore scribbles down his poses as easy as handwriting. Simple action lines that communicate instantly. (This scene was not used in production). Here Jose Carioca introduces himself as a parrot with an attitude that says, Don't you get it? The Gouchito seems doubtful, his hand covering his mouth. He is thinking this over. 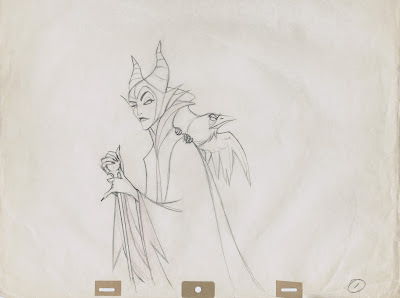 In this animation drawing Marc Davis depicts Maleficent and her raven with an almost equal attitude. Yet there is a subtle difference. Maleficent was about to leave the royal scene when the queen addresses her again. The bird though keeps his eye contact toward the king and queen, he seems even more hateful and disgusted than the witch. Note all the spiky shapes in the design, even in the raven's wing feathers. This is a couple to reckon with. 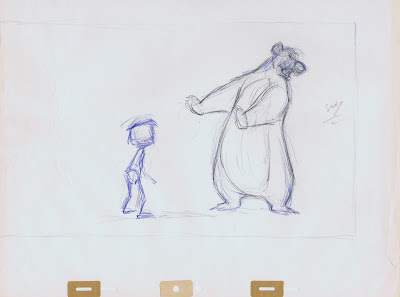 Baloo is about to demonstrate to Mowgli what a big bear growl sounds like. In this Frank Thomas scene he is leaning back in anticipation of a big move toward the boy. Mowgli is curious and his attention is with Baloo. He doesn't know what to expect next. Ollie Johnston animated this scene with Penny and Rufus, the old cat. 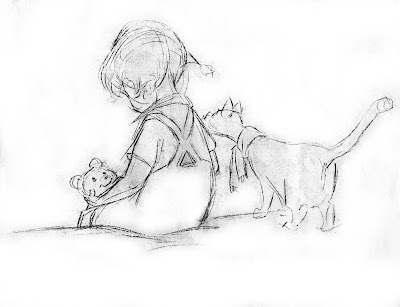 Penny is staged back view, and we don't see her face, but her body language signals resigned sadness very clearly. Rufus approaches her from screen right and tries to offer some comfort. One character in need of affection, the other one intending to help emotionally. 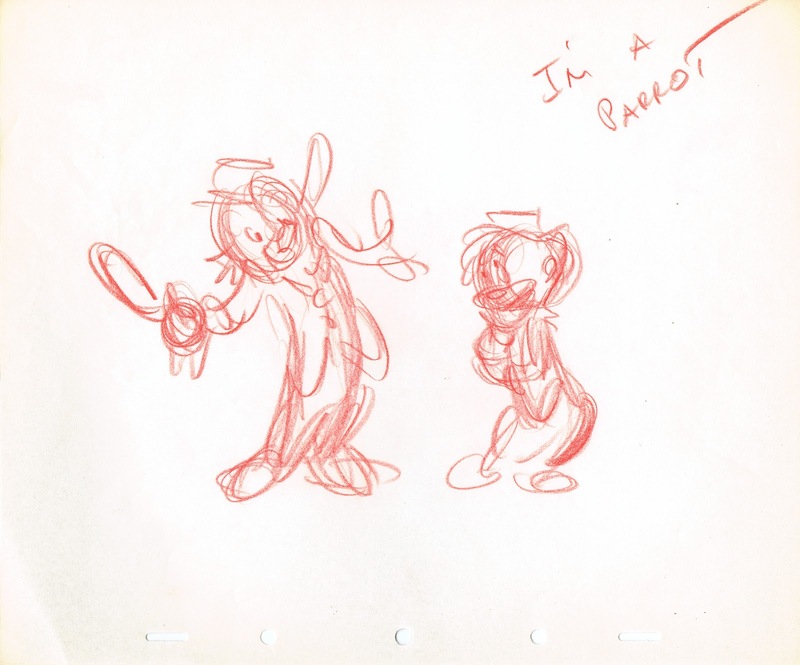 This is a somewhat unfinished animation rough by Milt Kahl. Penny is trying to resist Snoop's forceful pull, she doesn't want to search for that diamond. Snoops is lecturing her one last time before lowering her down into the cave. 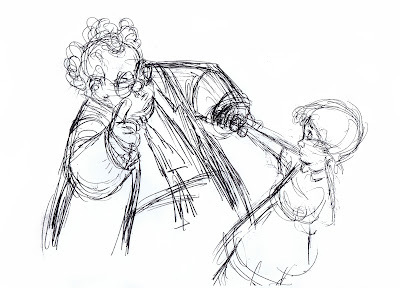 His body mass and strength overpowers Penny, who is brave enough for trying to stand firm against this bully. 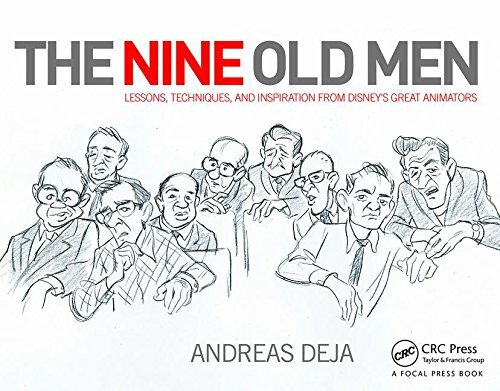 It's still so much fun to learn from the masters. Every step of the way they make you think about personality.